This Purchase Agreement is for a large medical office park consisting of several buildings occupied by doctors and medical professionals. It is drafted with the interests of the buyer in mind. The purchase price is to be paid in all cash following the completion of due diligence by the buyer. The seller is required to furnish a laundry list of due diligence materials to the buyer as itemized in the agreement. The agreement also contains assignment and assumption forms for tenant leases, service contracts and permits for the property which are included as exhibits. A. 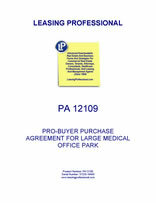 Seller owns certain real property located in _________ County, _________, having an address of _______________________ and more specifically described in Exhibit A attached hereto (the “Land”), commonly known as ____________ Medical Office Park and such other assets, as the same are herein described. B. Seller desires to sell to Buyer and Buyer desires to purchase from Seller the Land and the associated assets. 1.1.5. To the extent transferable, all building permits, certificates of occupancy and other certificates, permits, licenses and approvals relating to the Property (the “Permits”). 2.1.1. Within three (3) days following the date a fully executed original of this Agreement is delivered to the “Escrow Holder,” as such term is defined below (such delivery date hereinafter the “Effective Date”), Buyer shall deposit into Escrow (hereinafter defined) the amount of _______________ Dollars ($__________) (the “Initial Deposit”), in the form of a wire transfer payable to ___________ Title Insurance Company, _____________________ (“Escrow Holder”). Escrow Holder shall place the Initial Deposit into an interest bearing money market account at a bank or other financial institution reasonably satisfactory to Buyer, and interest thereon shall be credited to Buyer’s account and shall be deemed to be part of the Initial Deposit. 2.1.2. Within one (1) business day following the conclusion of the “Due Diligence Period” (hereinafter defined), and absent the termination of this Agreement pursuant to Paragraph 5.2, Buyer shall deliver to Escrow Holder the additional sum of ______________ Dollars ($_________), (the “Second Deposit” and together with the Initial Deposit, the “Deposit”). 2.1.3. On or before Close of Escrow, Buyer shall deposit with the Escrow Holder to be held in Escrow the balance of the Purchase Price, in immediately available funds by wire transfer made payable to Escrow Holder. 2.1.4. In the event that this Agreement is terminated by Buyer in accordance with its terms, the Deposit shall be immediately and automatically paid over to Buyer without the need for any further action by either party hereto. 3.1.2. The “Permitted Exceptions” (hereinafter defined) included in such policy and approved by Buyer as herein described. 3.2. Procedure for Approval of Title. Seller shall, no later than ten (10) days following the Effective Date (the “Delivery Date”), provide to Buyer a current title insurance commitment and/or preliminary title report for the Real Property, including legible copies of all items identified as exceptions therein (the “Title Documents”). Buyer shall have thirty (30) days following the later of (a) the Effective Date; and (b) the receipt of the later of the Title Documents and the Survey (hereinafter defined) to review and approve, in writing, the condition of the title to the Real Property (“Title Review Period”). If the Title Documents or the Survey reflect or disclose any defect, exception or other matter affecting the Real Property (“Title Defects”) that is unacceptable to Buyer, then Buyer shall provide Seller with written notice of Buyer’s objections no later than the conclusion of the Title Review Period; provided, however, if Buyer shall fail to notify Seller in writing within the Title Review Period either that the condition of title is acceptable or of any specific objections to the state of title to the Real Property, then Buyer shall be deemed to have accepted all exceptions to title or other conditions or matters which are shown on the Survey or described in the Title Documents. Seller may, at its sole option, elect, by written notice given to Buyer within three (3) days following the conclusion of the Title Review Period (“Seller’s Notice Period”), to cure or remove the objections made or deemed to have been made by Buyer; provided, however, Seller shall in all events have the obligation to (i) act in good faith in making such election and curing any Title Defects that Seller elects to cure, and (ii) specifically remove any consensual monetary encumbrances affecting the Real Property. The failure of Seller to deliver written notice electing to cure any or all such objected to exceptions during the Seller’s Notice Period shall be deemed an election by Seller not to cure such exceptions. Should Seller elect to attempt to cure or remove any objection, Seller shall have fifteen (15) days from the conclusion of the Title Review Period (“Cure Period”) in which to accomplish the cure. In the event Seller elects (or is deemed to have elected) not to cure or remove any objection, then Buyer shall be entitled, as Buyer’s sole and exclusive remedies, either to (i) terminate this Agreement and obtain a refund of the Deposit or (ii) waive any objections that Seller has not elected to cure and close this transaction as otherwise contemplated herein. The failure of Buyer to provide written notice to Seller within ten (10) days following the expiration of the Seller’s Notice Period waiving any objections Seller has not elected to cure shall be deemed an election by Buyer to terminate this Agreement. Any exceptions to title accepted by Buyer pursuant to the terms of this paragraph shall be deemed “Permitted Exceptions .”If the Title Review Period, as extended by the notice and cure periods provided above, extends beyond the Due Diligence Period, the Due Diligence Period shall automatically be extended to coincide with the Title Review Period, as extended by the notice and cure periods provided above, and the Close of Escrow shall be extended accordingly. If you purchase the Purchase Agreement featured on this page (the Qualifying Product Purchase Agreement), you will receive PA12101 Purchase Agreement Exhibit Sample Pack (90 single spaced pages) AT NO CHARGE as a free bonus. To receive PA12101, you must email us after you purchase the Qualifying Product Purchase Agreement described on this page to request it, and PA12101 will be emailed to you promptly. Do not include PA12101 in your shopping cart order, or you will be charged for it. For more information and a complete list of exhibits included in PA12101, click here. 1. Purchase your Qualifying Product Purchase Agreement through our online shopping cart. Do not place PA12101 (the bonus item) in the shopping cart, or the cart will charge you for PA12101. 2. Then, download your Qualifying Product Purchase Agreement. Do not include PA12101 (the bonus item) in your shopping cart order. 3. To receive PA12101 (the bonus item), you must email us after you purchase the Qualifying Product Purchase Agreement described on this page to request it, and PA12101 will be emailed to you promptly.